Have you been considering installing an artificial vertical garden? Did you know that you can install these in your office building? Inside or outside. In your garden, at home or at work. These vertical gardens can be small or really really big, covering many stories of a towering building. 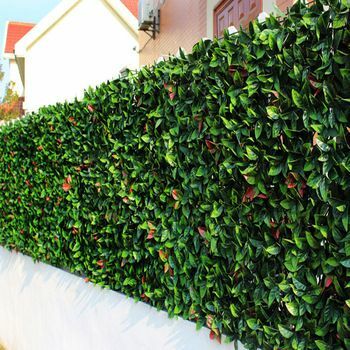 They can be used in the place of live plant walls, which are sometimes difficult to maintain. Live plant walls run into problems with different species needing different amounts of natural light, fresh air and water. Ongoing maintenance is required to keep the plants looking fresh, green or flowering, and all of similar shape and size so that the wall does not start to look bulky, outwardly bumpy and uneven. Once an artificial vertical garden wall is installed, there is almost none to very little maintenance required. Plants may need a dusting now and then, but once fixed to the wall, that is that. Outside fixtures will be cleaned by the rain or can be hosed down when cleaning the outside of the building’s windows. Drinking water is not needed for cleaning, especially in places of drought where water is scarce. Add some colour to your frontline reception area, front door area, double volume or higher entrance ways, boardrooms, lounges, or even the public and staff bathrooms. Living in an apartment block? Why not install vertical plant gardens to the outside walls or balconies or fencing around each section. The entire building would be given an immediate facelift and it would brighten the day of those living there. The same could be said for retirement villages and homes or hospitals. Beautiful vertical garden walls could greet homeowners and visitors to security estates and larger complex-type developments. Artificial plants are inspired by real plants and so what you love about the outdoors can be easily and safely brought indoors for you to look at whenever you feel like it.